VIENNA Advantage Integrated eGovernance ERP System assists Government Ministries and Departments in reaching out to the citizens, convey enhanced services, provide better accountability, ensure transparency and drive and employ advantageous policies. One basic goal of every democracy is servicing its people. In any country, the government is the largest organization since all citizens are involved in its operations. With the growing influence of technologies and the internet in our lives, people expect things to happen at a much higher speed and with more transparency. More than any corporation, the government needs to optimize its operations using technologies to serve its people better than ever before. Increasing the people’s satisfaction in this way becomes a success factor for better government. One of the key features is its Information Dashboards for deciders. Citizens can be involved by various means such as SMS alerts, online application status checks, telephone systems and many more. The time required to process applications of citizens is drastically reduced and their satisfaction towards officials increases. Apart from that, it supports approvals of applications even on mobile devices. Also, an in-built document management system is an important component that allows digitization and searches for documents, so that paper documents can be securely archived and all the work is based on digital documents. Learn more about the key eGovernance ERP features! Download free brochure here. Experience the award-winning open source ERP/CRM solution! 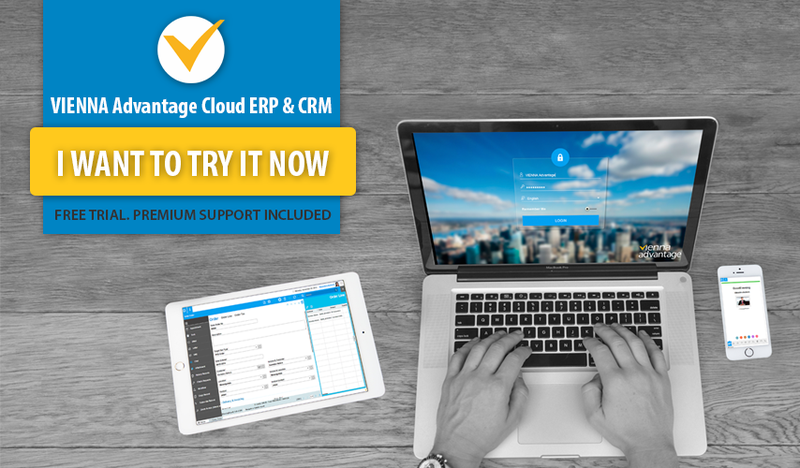 Try VIENNA Advantage Cloud ERP/CRM for free! No credit card required. No hidden costs. Premium support included!